Happy Memorial Day! Hope you are having a good one. The Orioles are finally back. They arrived last week and were later than usual I think. 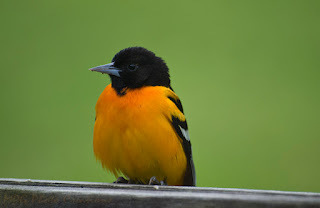 I have a one pair at least of Baltimore Orioles and then I have seen an immature male and also an Orchard Oriole. So our usual group seems to be back. I caught this male taking a break on the railing between feeding and got a nice close up of him.